This month we celebrate National Grandparents Day. This is a time to honor the older adults who have helped to shape our world. They are the memory keepers of our history. Many protected our country, labored for our economy, and contributed to technology and innovation. They also built our families, provided for our education and futures, and passed on our family traditions, recipes, photos and memories. They are a treasure of information and knowledge, and thus a generation worth treasuring. This year, we celebrate grandparents as a nation on September 9th. But Ann Arbor Meals on Wheels provides an opportunity for you to celebrate them throughout the year with a population who is in desperate need of attention and care. 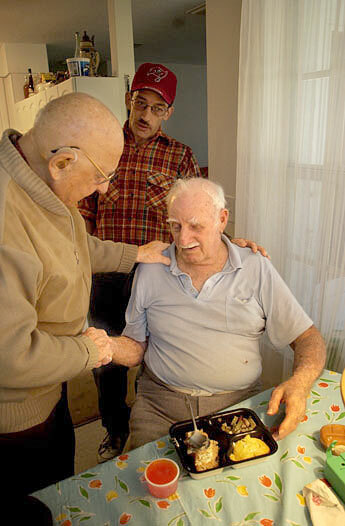 Many older adults are homebound due to illness, disabilities, or other age-related limitations. They may have children living hours away. Some may not have children or family at all. Yet they, too, have lived a life worth celebrating and remembering. For many, the Ann Arbor MOW volunteers are like family. Not only do the volunteers deliver nutritious meals, but they provide the much needed human contact that our clients need for good quality of life. For many, the volunteers are the only people they see all day. During these brief visits, volunteers and clients can share a smile, a laugh, or a memory. Many clients proudly share pictures of their grandchildren who live far away, or tell stories about when their children were young. Volunteers who are parents often bring their children on deliveries. Many clients are delighted by visits from young children, which can truly brighten their day. Volunteers also serve as the eyes and ears for family members who are unable to regularly check on their parents and grandparents. They make sure that their clients are feeling well. They look for signs of distress, such as poor hygiene, inability to keep up the home, or the client is unable to answer the door. If a volunteer has concerns, they immediately contact the home office where staff can take action, such as calling emergency services and/or contacting family. As we take a moment on Grandparents Day to remember our loved ones and celebrate their contributions to our lives, also remember those older adults who may not have family available for celebration. Consider becoming a member of our volunteer team. Whether you make yourself available as an occasional substitute driver, or you take on a regular delivery schedule, any amount of time you donate can make a difference in someone’s life. Delivery routes take 1-2 hours to complete. In that time, volunteers reach about 10-13 people. It doesn’t take long before volunteers get to know our clients and become a treasured part of their day. Please join us to celebrate and care for our older generation all year long. This entry was posted in Uncategorized and tagged aging, Ann Arbor Meals on Wheels, Ann Arbor Michigan, Family, Grandparent, homebound, National Grandparents Day, Old age, volunteer by Joyce Patterson, MPH. Bookmark the permalink.